It’s no surprise to you by now that Low-Utilization Payment Adjustments (LUPAs) can have a detrimental impact to home health agencies (HHAs) both clinically and financially. Clinically speaking, it is difficult to obtain best patient outcomes with very few visits. Financially, in some cases, a LUPA can be the difference between a $2,600 payment for an episode of care and an adjusted payment of $300. Not to mention the impact of the Centers for Medicare and Medicaid’s (CMSs) Triple Aim policy, which is focused on positive patient outcomes, positive experience of care, and a low per capita cost of care. As a result, Medicare pays HHAs a per visit rate instead of a full episode rate. Over time, this can add up to a significant loss in revenue. Under PDGM, LUPA thresholds will be based on clinical grouping and episode timing. New LUPA episodes, which will be evaluated annually by CMS, will range from two to six visit thresholds and vary across the clinical groupings. There will be a different visit threshold for each of the new 432 home health resource groups (HHRGs). In addition, the potential of a LUPA will now be in each 30-day payment period within the 60-day episode of care. For your agency to be truly ready for the implementation of this new structure, it is imperative that you understand the impact PDGM will have on your LUPAs prior to this change. 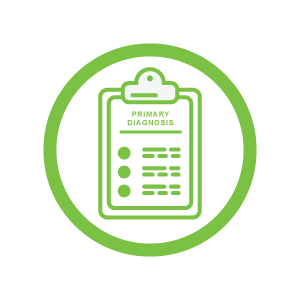 This preparation includes conducting an intense review of your current LUPAs as well as understanding the impact that 30-day periods of care will have when PDGM is implemented. 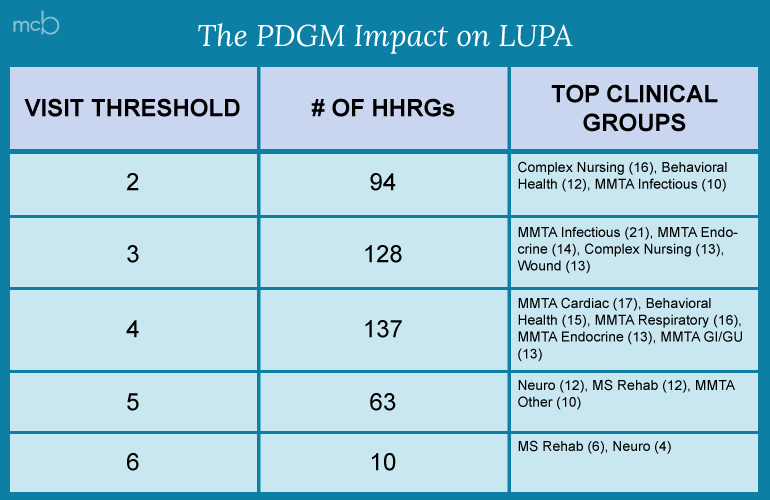 To understand factors that are causing LUPAs in your patient population well in advance of 2020, your PDGM committee should randomly review a percentage of LUPA episodes with varying diagnoses monthly for the next three to four months. Was the episode front-loaded at start of care (SOC) and resumption of care (ROC) to potentially reduce the chance for rehospitalization? Note: Front loading is typically at least three visits within the first seven days of care. Was the LUPA a result of missed visits, staffing issues, patient refusal and/or scheduling issues? Were the right disciplines added at SOC/ROC? From the findings of your internal LUPA review process, analyze your results and identify whether the LUPA could have been avoided. Investigate trends in avoidable versus unavoidable LUPA cases. Start developing processes to correct avoidable LUPAs and begin educating your staff on these best practices for care. It’s imperative to begin thinking about the management of PDGM 30-day periods of care. For example, for LUPA visits of two or less in a second 30-day period, determine if this low visit count is impacting clinical outcomes. Then consider how moving those one or two visits into the first 30-day period would impact the patient’s outcomes. It’s possible that the first 30-day care plan with the additional visits might produce better outcomes and the second 30-day period may not be needed and not transform into a LUPA. One way to analyze your risk for LUPAs within the second 30-day period would be to look at your organization’s 2017 data. This will give insight into which 30-day periods and what types of episodes would fall into LUPA categories in a PDGM environment. This type of impact analysis can help agencies understand what their strengths and weaknesses are moving forward. Sometimes a LUPA is inevitable, so it is important to consider the big picture as you think about your 2020 case-mix strategy. Under PDGM, with a 30-day period to assess and treat a patient efficiently, we should front-load these patients with three visits in the first seven days of care. Organizations should utilize the comprehensive SOC assessment to determine the need for additional disciplines and obtain orders quickly to support the patient’s needs. If remote patient monitoring is available this will also be a vital tool to help manage the 30-day period. Efficient OASIS assessment and education, effective coding practices, strategic management of the episode and sending in the right discipline at the right time for the right amount of time are key. Case management remains central, and seamless collaboration and communication has never been more important. Effective management of LUPA episodes has always been a challenge- and in the PDGM world, it just got trickier! Read the full article in HomeCare Magazine. Laurie Salmons, RN, BSN, is a Clinical Consulting Manager for McBee. She manges McBee’s episode management practice and specializes in outcomes and performance improvement for home care providers. She is a seasoned speaker on outcomes improvement and PDGM and has spoken at conferences across the country.